I got all the aforementioned updates; however, kb4463103 was prompted for again after I rebooted and checked. I downloaded it manually and used the trusty /overwriteoem switch and that resolved the issue. I got all the aforementioned updates; however, kb4463103 ﻿was prompted for again after I rebooted and checked. I downloaded it manually and used the trusty /overwriteoem switch and that resolved the issue. Same situation, but solved with "Start button - Shut down"
In this dialog is shown that a update is pending. Then the button "Shut down" install the update properly. Vistaboy - but then in 2020 we'll all be back for Win 7. Hey, is there a Win 7 POS? Hey, is there a Win 7 POS﻿? No. 2021 actually. Windows Embedded POSReady 7 updates just work on 7. It's EoS is at the end of 2021. Bu does it mean it works until 10th December or until 12th of October? Mcinwwl - October 12, 2021 - three years from yesterday, And considering that it's only four years since I started doing the XP POS updates (thanks to this thread), those three years will pass fast enough. I am NOT looking forward to Win 10, neither at home nor at work. Does anyone know how many people are actually (still) updating XP with the POS hack? However only on one system. The other XP x86 system remains at an early 2018 level, or so, mainly because I'm lazy. Only Microsoft knows, as there's no way for us to know how many systems are getting updates. Anyway, we do know how many people are still running XP in percentage. Sadly Windows 10 surpassed Windows 7 once and for all, as people are now afraid that they are gonna be left behind due to the end of support and businesses already started to migrate to Windows 10. As to XP, the support is almost over, but that's not the reason why some people left. 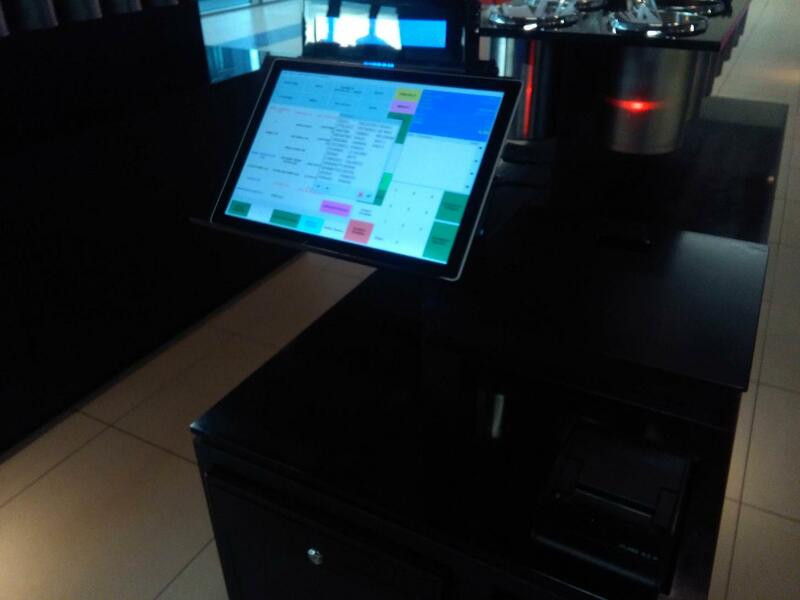 I think that some POS have just been replaced with brand new hardware that runs Windows 10 IoT (in other words, Windows 10 Embedded) like the ones in the canteen we have at work. As to people running XP on their home personal computers, their hardware probably blew up or they bought it brand new for whatever reason and they are now using Windows 10 and (maybe) they open incompatible programmes with an XP virtual machine. Due to these facts, XP lost market share and it has been surpassed by Win8.1. 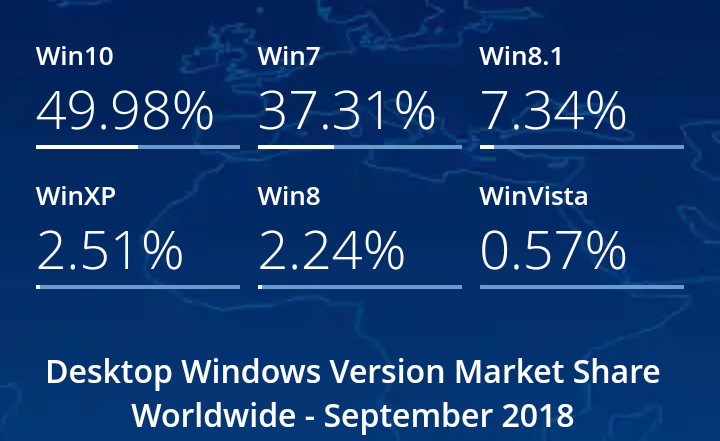 Windows 8 remains stable at a lower percentage and Vista is close to zero (but it has never been popular even back in the days). Now, if the whole Windows marketshare on Feb 2015 was 1.5x109 machines, and it was about 90% of the whole market in 2015, the full market was 1.7x109 machines back then. And since those numbers surely didn't change much since then, my estimate that full PC universe comprises some 2 billion machines is generally correct... and that means about 200 million is really the total number of XP users at present. Wow! The last time I've estimated the size of the full PC universe, as you can see in the quotation above, I came to 2 billion machines. Let's assume it didn't grow any, just for the sake of simplicity, and that means 5.66% of 2x109 = 113x106 machines or, in other words, there's still a minimum of about 100 million XP users today, not counting the true POSReady and related machines, which purportedly don't browse the web, so that they don't get counted by netmarketshare. So no, not at all, we're still very far from being the last half-a-score of XP users in the world!!! 3.19% x 2 x109 = 6.38 x107 & 2.51% x 2 x109 = 5.02 x107 ... to get to an estimate that minimizes our ignorance, let's take the geometric mean of those two values and we get 5.66 x107, which means there should still be some 50 million XP users today, which is not bad, considering we're 6 months away from POSReady 2009 EoS. AFAIK W7, as Vista, doesn't support a registry hack like POSReady2009 for XP, In the worst case of hanging updates for XP-PosReady tricked, you have install one update (IE8) at most and you get back yellow shield for automated download/installaion of everything rest. For Vista that was (and it will be for W7) more problematic cause it's really awkward going on MS catalogue every month and downloading-installing one-by-one every single update. Maybe, the cumulative update policy for W7 can mitigate this issue (about number of hotfix), but i'm not aware of this.